Several of our clients’ pets at Blue Mountain Veterinary have had excellent results and have a new “leash” on life, thanks to stem cell therapy. In partnership with MediVet, we can now treat conditions such as osteoarthritis, tendon and ligament injuries, and support surgical repair of joints and ligaments. This treatment works by taking a small amount of fat from the patient, and extracting stem cells from it. They then go through a process to clean and propagate the cells, which are injected back into the affected area. 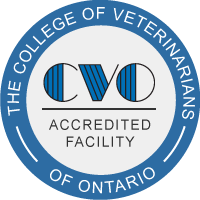 We are very excited to be providing this breakthrough treatment for the pets we care for at Blue Mountain Veterinary Services. Several of our clients’ pets have had excellent results and have a new “leash” on life, thanks to stem cell therapy. In partnership with MediVet, we can now treat conditions such as osteoarthritis, tendon and ligament injuries, and support surgical repair of joints and ligaments. This treatment works by taking a small amount of fat from the patient, and extracting stem cells from it. They then go through a process to clean and propagate the cells, which are injected back into the affected area. One area of stem cell therapy that Dr. Gray is excited about is its potential for treating some forms of liver disease. ﻿Stem cell therapy is a proven treatment that is helping thousands of dogs and cats to overcome injuries and chronic conditions that would otherwise deeply impact their lives. Please see an article in "Work and Play in North Grey" for more information about this service. Also see an article written by The Enterprise Bulletinhere.